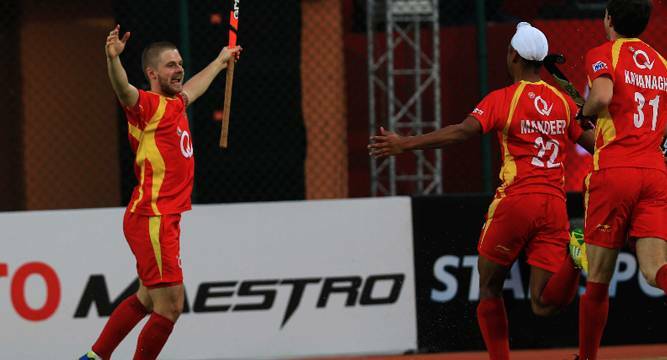 Former India captain Sandeep Singh struck the winning goal from a penalty corner as defending champions Ranchi Rays rallied to beat Jaypee Punjab Warriors 5-4 in a pulsating match and jump to the top position in the Hockey India League today. The Warriors, the last edition runners-up, led 2-0 at the end of the first quarter through a field goal from Armaan Qureshi in the seventh minute before the home side took a 2-1 lead in the second quarter through field strikes from Kothajit Singh (18th) and Daniel Beale (28th). The visiting side restored parity in the 31st minute with Satbir Singh scoring a field goal, which is counted as two under new tournament rules. On an even keel just a minute into the second half, there was little to separate between the two sides who played against each other in the summit clash of the last edition, as both pressed for goals and sought dominance. Ranchi Rays, however, had the last laugh as ace drag-flicker Sandeep scored the winner, his first goal of the tournament, from the penalty corner to the jubilation of the home crowd. Ranchi-based side have secured 21 points from five matches,five points clear of second-placed Delhi Waveriders (16 points).